Shot charts display the distribution of a player’s shot position and trajectory of ball over time. It’s not uncommon for professional tennis players to make between 150 and 200 shots per match (excluding serves and serves returns). Over a season this amounts to a lot of data and it can be challenging for players and coaches to try and understand or summarise this amount of information. Enter the shot chart. Shot charts aggregate information into an artificial grid or in this case fifteen sections of the court. For example; all of the wide deuce court shots are gathered up and summarized and all of the shots taken from the centre of the court on the baseline are gathered up and summarized, and so on and so on. In doing so we are able to start seeing patterns of play not normally seen by simply looking at the raw data. What can we learn from shot charts? 1. Shot position (the blue dots at the left end of the court). 2. Ball bounce position (the blue dots at the right end of the court). 3. 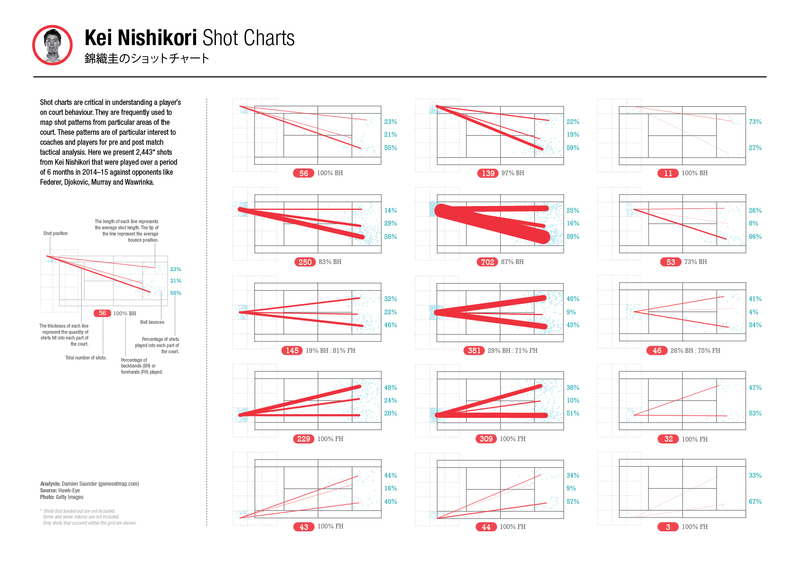 The average length of each shot (shown by the length of each red line). 4. The average bounce position of each shot (shown by the position of the end of each red line). 5. The frequency (number of shots) from a particular part of the court (thicker red lines indicate a higher frequency of shots). 6. The percentage of shots played into each part of the court. 7. The total number of shots played from a particular part of the court. 8. 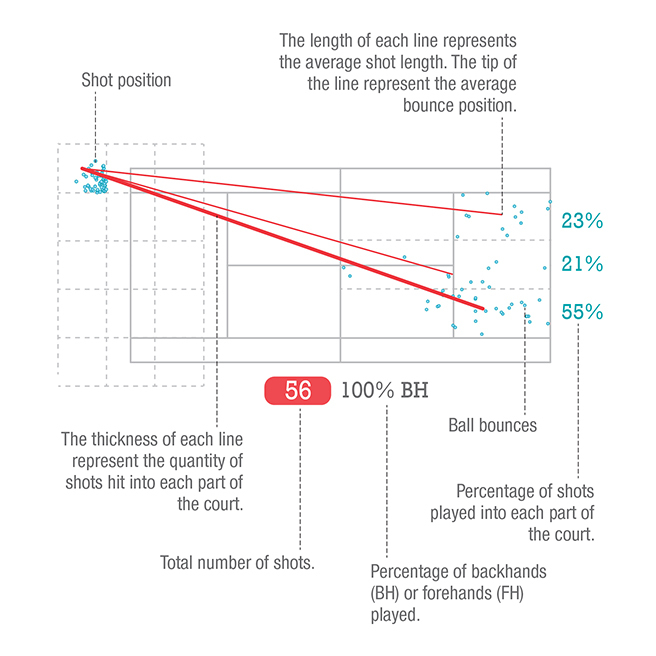 The percentage of forehands and backhands played from a particular part of the court. • Is the player playing to their strengths? • Are they being too predictable? • Are they getting themselves into a good court position? • Are they getting good depth on their shots? Shot charts also provide a way for players to better understand their opponent’s tendencies and they give players an opportunity to come into their matches better prepared tactically. 1. Kei loves playing backhand cross-court. It’s his favourite shot and he hits it a lot. The charts reveal that he plays backhand cross-court almost 60% of the time from the baseline. It’s his highest frequency shot. Kei looks to have his opponents right where he wants them, battling it out in backhand-to-backhand cross-court exchanges. 2. ?Kei plays up on the baseline. He played 1,266 (52%) shots from on or around the baseline compared to 145 (6%) inside the baseline, and 723 (42%) from behind the baseline. This keeps Kei in an attacking position, meaning he’ll be ready to pounce on any short ball that comes his way. 3. Kei hits short down-the-middle. From almost all of the sections of the court Kei’s backhand and forehand down-the-middle shots land shorter than his cross-court or down-the-line shots. There may be a little opening here for his opponents to attack his shorter balls. 4. Kei goes big on the forehand down-the-line. When Kei plays up on the baseline in the deuce court he loves to pull the trigger on his forehand down-the-line shot. Almost 51% of his shots from this part of the court go down-the-line. This goes against the general belief that the bulk of groundstroke exchanges are played cross-court. 5. Court position influences shot selection. Kei is patient. When he’s in a defensive position he goes back to basics and grinds it out. Check out his deuce court numbers from behind the baseline. He plays a traditional cross-court game almost half of the time (48%). He then waits for a better court position (i.e. when he’s closer to the baseline) before going down-the-line. He does the same on both sides of his body. Shots charts are just one of many data visualization techniques that can be applied to tennis in order to better understand what is happening on the court. These simple but very effective diagrams pack a lot of information, which makes it easy for coaches and players to understand and learn from. Right now tennis is experiencing a new wave of statistics and we are seeing players and coaches increasingly use this information for their benefit. This data driven approach to improving player performance is becoming a key part of the tennis landscape particularly as more and more affordable tracking devices come on the market. I encourage you all to start thinking about how you can better measure your performance by using a data driven approach. 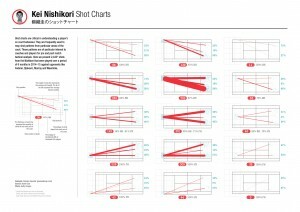 Shots that landed out have been excluded from the charts. Serve and serve returns are not included. Only shots that occurred within the grid are shown. Damien Saunder is a performance analyst who supports elite tennis players and coaches in the area of data visualisation and analytics.